Every year since 2004, Pink Wings has come up with a different design for our Walk Pink Ribbon Pin Collection. The 2012 features a ribbon with the words Walk to End it. This is a great pin for all you walkers out there- Susan G. Komen 3 Day for the Cure, Race for the Cure, Avon Walk for Breast Cancer, Revlon Run Walk for Women's Cancers, Relay for Life, etc. Please check the website for other pins available for the Walk Collection. I have a few pins from all years from 2004 to present. Once the year pins sell out- I will not be getting any more. Buy yours today! 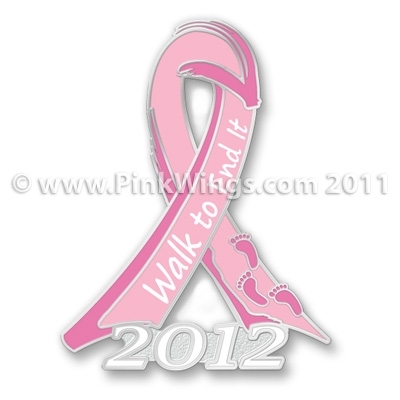 I have fewer than 75 left of the 2012 Collector's Walk Pink Ribbon pin.